When my family travels we take lots of little things to keep our little one entertained. One of my favorite things to take with us are Crayola Color Wonder markers, finger paints, and work pads. They keep my girl busy and me headache free. I’m happy to say that one of my favorite blogs, Modern Mami, is hosting a fantastic Crayola Color Wonder giveaway! 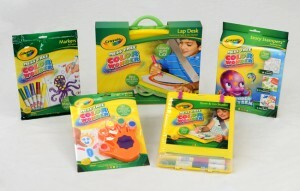 Crayola Color Wonder Lap Desk provides a large, hard-top surface for kids to create on the go. The sturdy desk has a built-in handle and a soft detachable pillow that can be used as a storage unit for Color Wonder markers and paper. The Lap Desk is equipped with 12 re-stickable pieces of Color Wonder paper to keep kids’ drawings in place and 5 Color Wonder mess-free mini markers in red, orange, yellow, green and blue. Crayola Color Wonder Fingerpaints & Paper make the once impossible possible – fingerpainting in the car! The set includes clear, fast-drying gels that feel just like traditional fingerpaint. The set comes with 5 mess-free colors (red, yellow, green, blue and orange) in a hand-shaped storage container, a built-in finger cleaning sponge and 12 extra-wide sheets of Color Wonder paper. When kids are finished painting, they simply snap the fingerprint lids closed and paint stays fresh and ready to use again! Crayola Color Wonder Markers and Paper – The set includes 5 Color Wonder markers and a 24-page Color Wonder drawing pad where your kids can create anything they want while you’re on the road! Crayola Color Wonder Stow & Go Studio provides a solid, compact drawing surface with stay-put clips that can secure a single piece of paper or an entire Color Wonder activity book. Kids will enjoy creating with mess-free Color Wonder markers that make colors magically appear on special paper and reveal special hidden surprises. Crayola Color Wonder Story Stampers includes 5 Color Wonder markers in red, blue, green, purple and orange, a Color Wonder stamp pad, 6 sea creature stamps, and an 18-page coloring pad with undersea background settings. Each setting is unique, so every page will inspire a different fish tale just waiting to be told! Kids’ imaginations will take them beneath the sea as they stamp color sea creatures using the colorless Color Wonder stamp pad to create innovative stories and scenarios then can then color in. It’s like high tide for your imagination! Hurry, this giveaway ends August 9th.